The two comediennes - who will star in a forthcoming flick aptly titled 'Sisters' together - have known each other for over two decades now, but 'Date Night' star Tina admitted if the 'Inside Out' actress was her actual sibling they wouldn't have the great bond and working relationship they've developed over the years. Tina, 45, said: "If we had grown up as sisters it would be like, 'We can't both grow up and do this. We can't both be on 'Saturday Night Live', that would be weird.' That would have been messed up." 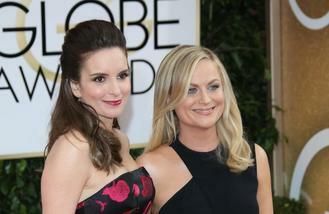 Discussing their bond, Amy, 44, told Stylist magazine: "We feel like sisters. "We've known each other for over 20 years now and a lot about being a family is having those experiences and remembering someone from when you're trying to figure out who you're supposed to be. Tina and I met each other in Chicago in the mid-Nineties when we were on the path where we weren't quite sure what we were going to be." Elsewhere, Amy - who has presented 'Saturday Night Live' and the Golden Globes to much-acclaim with her close pal - described her friendship with the brunette beauty as being able to jump off a bridge for one and other. In her 2014 memoir 'Yes Please', Amy wrote: "Sometimes Tina is like a very talented bungee-jumping expert. All it takes is Tina to say, 'We can do this right?' and I feel like I can jump off a bridge."